In this day and age you can’t move for zombies; zombies on the television, zombies at the cinema, zombies in your comics zombies even in your Lego, Christ even flash mob zombies while you’re trying to have a coffee in Starbucks. However, nowadays zombies aren’t what they use to be, all running around and the like, all apart from the excellent new The Walking Dead. So let’s get back to some old-school, original, top of the range zombie action with George A. Romero’s subversive Dawn of the Dead. 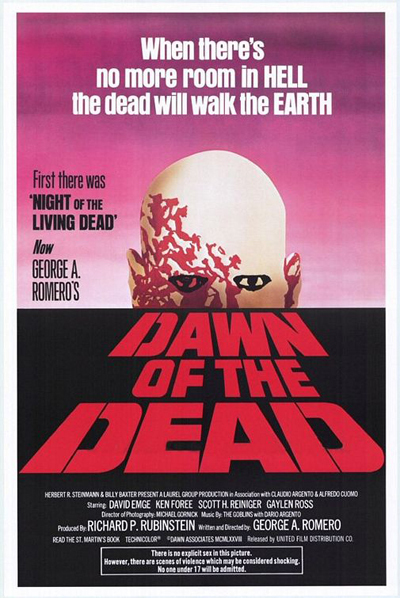 Following on from the landmark film that was Night of the Living Dead, Romero moves the story forward along as society starts to falter under continuing raise of the dead. With airwaves broadcasting message of doom to the populous and the government ordering people from their homes to secure facilities, by force if need be. So as society gradually falls, decisions have to be made, to stay or to go, to help others or to save one’s self. These major decisions are all planned out in the opening scenes of Dawn of the Dead as Stephen (David Emge – The Booby Hatch and Basket Case 2),boyfriend of Francine (Gaylen Ross – Madman and Creepshow) ,an employee at a local television and radio station, decided to take the station’s helicopter and leave, as the station itself falls into chaos with employees walking out and on air arguments breaking out about the impending doom. At the same time, SAWT teams are moving into buildings to move people out and onto the government secure locations for their safety. One team however faces tough resistance from the occupants and bloodshed and zombies ensue. Two officers within such a team, Roger (Scott H. Reiniger – Knightriders and Dawn of the Dead 2004) and Peter (Ken Foree – Death Spa and The Devil’s Rejects) come to see the futility of their actions and also decide to leave, joining Stephen and Fran at the helicopter to make their way west in an attempt to find a safe place. The four, all with their decision to leave what they knew behind, head for whatever safety they can find, all seeming to know within themselves that things are not going to get any better for them wherever they go. However, as they make their way west, the group come across an abandoned shopping mall and see it as place of safety, or is it? As the four bed themselves into the Monroeville Mall, after clearing out the zombies and barricading the main entrances, the true underlying message of Romero’s story starts to comes to light. As the four enjoy the unbridled pleasure of looting and consumerism within this temple to shopping, as they take what they want when they want, however still contain within this prison of their own making. With the joys of unabashed shopping to be had, this façade of contentment is shattered with the arrival of a biker gang seeing the mall as an excuse for rampaging and looting, as a marker to the complete fall of society, law and order. So with the biker gang just out for themselves and not seeing the mall as a place of safety from the undead, they head in and unwittingly let the undead in with them. With the situation going from bad to worse very rapidly, who will survive the undead? As their urge to consume brains and flesh will never stop, much like their living counterparts’ urge to consume goods and chattels, making it hard to distinguish one from another, in this cynical swipe at the American way of life. As we all know Dawn of the Dead is a piece of cinematic history now and the cornerstone of zombies in film. So when it come to my personal view of the film is pretty irrelevant in the grand scheme of how the film is seen be the masses but for me I feel I must join the masses, like a zombie, and shuffle along to the same deathly groan that this is top slice of zombie fun. Do remember however, when you’re trudging through the shopping centres and malls in these last days before Christmas to get those remaining gifts, just think of the other zombies around you doing exactly the same as you, without thought, without feeling, just wanting to consume anything and everything, because you too are a zombie to this temple of shopping. The two zombie children who attack Peter in the airport chart house are played by Donna Savini and Mike Savini, the real-life niece and nephew of Tom Savini. Incidently, these are the only zombies in all of Romero’s “Dead” films that spontaneously run and never do the trademark “Zombie shuffle”.